Good morning! 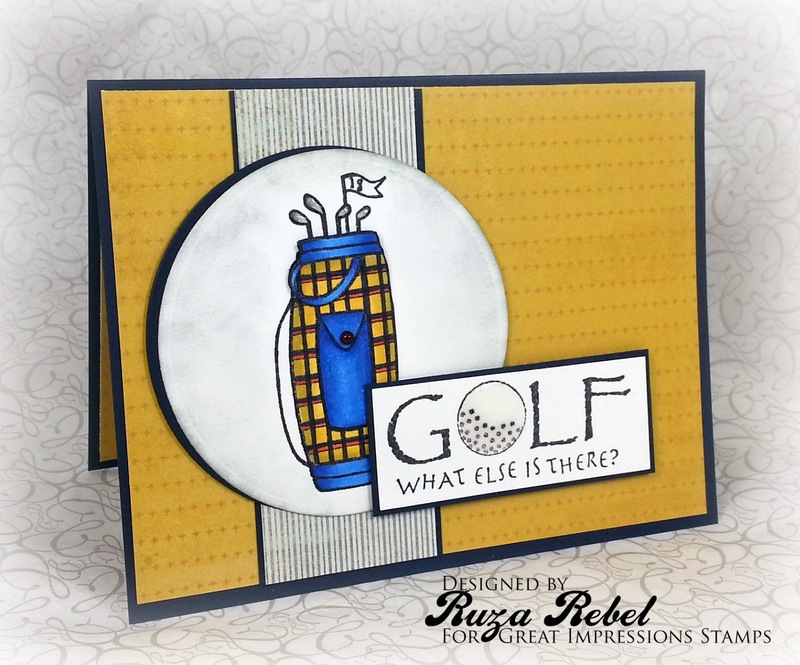 Ruza here to share a masculine card with you featuring the Vintage Golf Bag (E503) along with the What Else is There Sentiment (D297) from Great Impressions Stamps. I started out by stamping the Vintage Golf Bag three times. One I cut out with my Nestabilities Circle Die, colored the other two with my Copic Markers, did a bit of fussy cutting and layered the image together to add a bit of dimension. I layered the panel on my background and added a red pearl to the pocket on the bag. I then stamped the What Else is There Sentiment, layered it on navy cardstock, and added it to the card with 3D Foam Square. The final step was to add some Glossy Accents to the golf ball and clubs. A NEW Great Impressions Challenge goes live this coming Sunday. Make you stop by for all of the details, and if you use some Great Impressions Stamps make sure you link them up in our Customer Gallery! Oh, love this card. What a great masculine card. Thanks for sharing. Your card is fabulous. I love the colors and the sentiment.